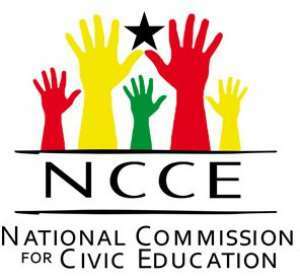 The National Commission for Civic Education (NCCE), has carried out their ongoing anti-corruption educational message to students of the Oda Senior High School (ODASCO) in the Birim Central Municipality of the Eastern region. The programme among other things was aimed at targeting students for corruption awareness to enable them to absorb good moral values as well as a sense of hatred for the canker, as they grow. The programme, with funding support from the Government of Ghana and the European Union, was on the theme “Citizens for Transparency and Accountability”. This forms part of the NCCE’s Accountability, Rule of Law and Anti-corruption Programme (ARAP). In an address, the Birim Central Municipal Director, Madam Rejoice Biscoff called on all stakeholders to tackle corruption head-on, as the canker had become a huge burden on the Ghanaian society. She noted that corruption was a moral canker that is eating into the fabric of the socio-economic, cultural and political lives of Ghanaian and if maximum attention is not paid, would derail the future leaders of this country. The sensitization programme she said would assist the students to appreciate its negative impact on society and abandon all its forms and appearance as they become adults. Madam Biscoff assured the general public that, the commission would go all round to empower citizens to demand accountability from public office holders and other duty bearers and also encourage people to refrain from practices that constitute corruption. Touching on some legal regimes in the fight against corruption, the Municipal Director of the Commission on Human Rights and Administrative Justice (CHRAJ), Mr. Cephas Atido said the Whistle Blower Act which had come to stay would help raised consents about malpractices that were taking place in organizations and indicated that citizens would have the courage to report corruption and other related malpractices to the appropriate authorities such as CHRAJ, the Economic and Organize Crime Office (EOCO), Legal Aid, the Police Service adding that one would be rewarded for exposing these negative practices from the Whistle Blower Fund. He recapped that, citizens were enjoined under Article 41 (f) of the 1992 Constitution to protect and preserve public property, expose and combat misuse and waste of public funds and property. Mr. Atido further attributed the growing canker to failure by citizens to demand accountability from duty bearers, non-adherence to rules and regulations and failure to follow laid down procedures in seeking public services. On his part, the Oda Divisional Police Commander, ACP Fleance Senam Adikah, said corruption is the abuse of entrusted power for private gain, which manifests itself in the form of bribery, embezzlement, tax evasion, and avoidance, moonlighting and littering among other. He reminded the public that the act negatively affected state revenue needed for social amenities for deprived areas and appealed to the government as a matter of agency to establish laws on spot-fines particularly on vehicles that do not meet standards on our roads so as to generate instant revenue for the state. On his colleague police personnel, ACP Senam Adika said, the police exist to protect life and properties and therefore urged officers not to misuse the authority vested in them by the state but do their work effectively without fear or favour. He indicated that offenders of corruption could be liable to a jail term between 5-35 years and encourage the public to report corrupt officials to the police.